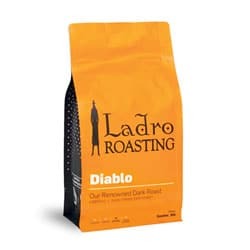 Ladro Coffee Cards earn 2 free coffee drinks for every 10 coffee drinks purchased. That’s a lot of free coffee (18% savings)! 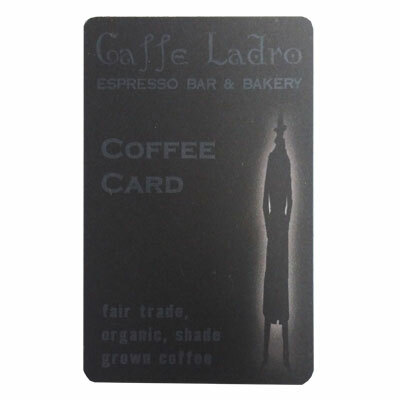 Coffee Cards may be used ONLY at Caffe Ladro retail locations. 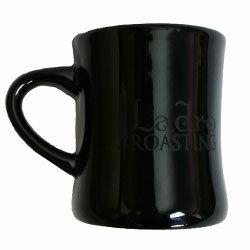 Use them for purchasing whatever you adore: whole bean coffee, merchandise, coffee drinks, and more. If you'd like to purchase a gift for use at our online store, please purchase an Online Gift Certificate. Please choose the amount you wish to put on your Coffee Card when adding it to your basket. Our Coffee Cards always ship for free. From Anonymous of Sammamish, Washington on 3/9/2019 . I purchase coffee cards online for all occasions. My friends love receiving them. No shipping charge. Love Ladro! From Anonymous of Bothell, Washington on 1/29/2018 . Couldn’t believe how fast this card arrived for the recipient. Will order again! From Prescille F Yamamoto of East Hartford, Connecticut on 12/21/2017 . Wonderful transaction! Gift sent to granddaughter, to give to her Mom from her Mom for Christmas. Last time I thought I was purchasing a gift card it turned out to be a online ability to make a purchase. Didn't work as a gift card. Not happy. So please this is a true gift card. Merry Christmas, Healthy 'n Happy New Year! From Amy Freyer of Portland, Oregon on 5/28/2017 . Great gift card. Fast shipping. From Anonymous of Champaign, Illinois on 7/21/2016 . Bought for a friend moving to Seattle. Arrived with enough to give to her in person. Great customer service! From Anonymous of Chicago, Illinois on 3/26/2016 . Birthday gift for my sister-in-law who loves this cafe. Arrived promptly and very happy. From Linda Krogen Brandt of Fargo, North Dakota on 1/7/2016 . I could not be happier with the service I received to purchase a gift card for family that lives in Seattle. Your web site is extremely easy to maneuver. The personal attention, by email, including the follow-up, was outstanding and very efficient. I will continue to purchase gift cards as long as my family living there stops at Caffe Ladro! From Ren of Tacoma, Washington on 11/9/2015 . Best present ever for my hubby! From Prescille F Yamamoto of East Hartford, Connecticut on 5/16/2015 . My daughter lives 3,0000 plus miles from me. Great way to drop a bit of surprise and comfort to a loved one. Thank you for being there. 3/2/2018 – How do I recharge my coffee card? Response From Caffe Ladro: You can reload your card at any Caffe Ladro location. Simply present your card to the barista and ask him/her to add the amount you would like using cash, credit or debit. 12/1/2015 – Is the coffee card rechargeable? If not, how do you track 10 coffee drinks across multiple cards? Response From Caffe Ladro: Yes it is! To clarify, two free drinks are awarded after the purchase of ten coffees.